Whenever you download an paid app from other sources than Google Play it checks for license and as you wouldn’t have license, you couldn’t use that app. But now, with Modded Play store you can easily use those apps as this modded app verifies License of any app and without Internet connection too. So, you no longer need to remove License verification with Lucky patcher. Modded Google play store never auto updates. If you download an paid app from google play you can refund your payment within 2 hours and paid version of app will be uninstalled from your device but with modded play store your money refunds but app also keeps installed. 1)You CAN’T download paid apps for free directly (still you can use refund trick) and its NOT applicable in billing that means You cannot hack in-app purchases with it. 2)YOUR PHONE MUST BE ROOTED. HOW TO DOWNLOAD, INSTALL AND USE MODDED GOOGLE PLAY STORE? This is easier method. If this method fails, try second method. Download Lucky Patcher from our site. Install Lucky patcher and Open it, Grant root access. Tap on Toolbox at the bottom and scroll down to find “Patch to android”. Tick the first, second and fourth options which are “Signature verification status always true” and “Disable .apk signature verification” and “Support patch for InApp and LVL emulation”. Tap apply. your device will reboot at this time. Open Lucky patcher and go to patch to android option again to see whether “patch applied” is written or not. If patch is not applied , patch again. You can backup original play store using Titanium backup in case you want it later. Now Go back and tap on tool box again. Scroll down to find install modded play store. Now select the latest modded play store at top and tap install. If you are a gingerbread user, download Modded play store for Gingerbread. Modded play store will be downloaded and installed. After play store gets installed, your device will reboot. If it didn’t, reboot it yourself. Congratulations. You successfully installed modded play store. Lucky patcher is a most useful and valuable app for all the android users. As it can perform many useful things that other apps can’t. It can bypass premium features of paid apps , can backup and restore apps, can controls ads in apps, and many more! Below you can find the download links of lucky patcher games up to the latest version available. Lucky patcher apk is an fantastic android tool to get free in app purchases, Install modded play store, remove ads and License verification from android apps and games. Lucky patcher can be used on android and also on PC or windows with the help of bluestacks. If you want to use lucky patcher on PC, please click here to jump to PC section. How to install modded Play Store ? 1. 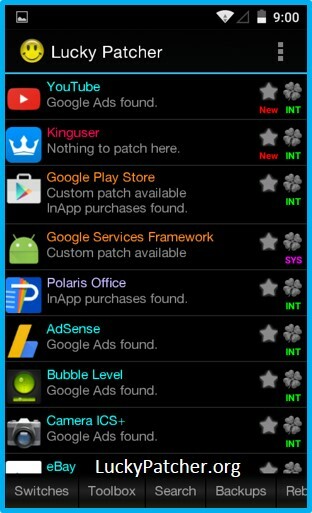 Install latest Lucky Patcher. 2. Run Lucky Patcher > Menu > select "Patch to Android". 3. Select "Signature Verify always True" and "Disable Zip Signature Verify" > Apply > Yes. 4. After reboot, go to "Patch to Android" and check (Patch applied). If applied, exit from Lucky patcher otherwise do third step again. 5. Backup current Play Store with Titanium Backup if you want to restore original version in case. - Gingerbread users > rename to "Vending.apk". - ICS / Jelly Bean users > rename to "PhoneSky.apk". 7. Open Root Explorer and copy/replace renamed apk to "/system/app/" folder. 8. Set permissions "rw-r--r--" and reboot. 9. Done. All apps on device with "LVL" are licensed.